Bamboos generally don't bear fruits of any kind. That said, guess what happened yesterday? 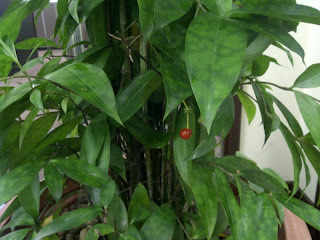 My dad discovered that his bamboo tree has a single, bright red berry. It doesn't happen in nature, and even the gardener who had been working for ten years said that he had never seen such an occurrence before. I'll let the photo speak for itself. Take a look below (click to make it bigger). Now how is that for a miracle?